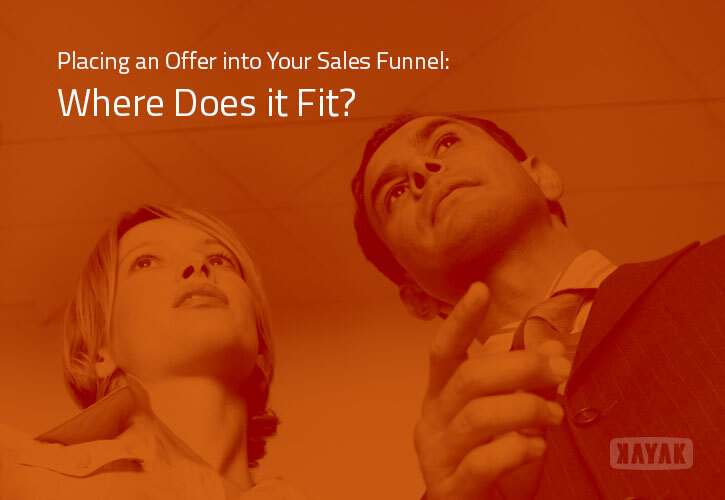 The idea behind sales funnels has been with us for quite a while, and there isn't any big mystery about the way they're supposed to work: You create offers (like downloadable content) to get prospects interested, and then present successive offers and communications to engage them further. This simple formula tends to be harder to actually implement, however. As an example, one of the issues new clients tend to run into is deciding where in the sales funnel a particular piece of content should go. The answer can be pretty important, since the placement of content affects not only how it's offered, but also the length and complexity needed to create it. Something that's merely meant to attract eyes (like a blog post, for example) has a different purpose than a premium content 50-page white paper to help persuade your prospects to take action. They are different tools for different jobs. 1. Envision your sales funnel as part of a bigger strategy. This is a nice way of saying you shouldn't be "winging it" with your content strategy. Instead, you should envision a typical flowchart of new customer interactions – perhaps with blogs at the top and your final sales offer at the bottom, for example – along with the types of content you'd want to have at each stage. Once you have populated the steps with the necessary items, you can go back and start adding more to each. 2. Use great ideas in multiple ways. There's no reason you can't use a great idea more than once. Some of the best posts and offers come from a single moment of inspiration. For instance, one single thought could lead to a good tweet, a longer blog post, a detailed infographic, and even a full-length e-book. The difference between them could be the audience, the detail, or even the timing. As long as each one has value on its own, there's no reason not to keep expanding on a good idea. 3. The bigger the value, the bigger the ask. Generally speaking, the rule of thumb is that you want to ask just a little bit more more of your prospect each time you give them something bigger. So, while blog posts and guest articles are "free," a simple tip sheet might require a valid email address and a first name. To go further into the sales process and receive a downloadable worksheet or app, for example, you might require a bit more information, like their job title, company or industry. If what you're offering has value, it's fair for you to ask more in return. Because generating inbound leads is the name of the game, it can be easy (and tempting) for marketers to skip steps and simply go right to the end of their sales funnels. This usually involves having something like a downloadable report and asking prospects to give up a lot of information to get it so that you can move immediately to close the sale. As understandable as that impulse is, it's likely going to harm your click-through rates, which wouldn’t be a good thing. Instead of skipping steps, supply useful information to your prospects and trust the process. In the end, you'll be glad you did, because with each helpful piece and step, you earn more buy-in. Once you have your sales funnel established, it will be easier for you to tell where new pieces of content should fit in, and how they can best be used to encourage conversions at different steps in the process. Until then, your best bet is to see your relationship with a new prospect as a whole, and then try to decide when they would want to see the information you have to offer. You'll always get better results thinking of prospects first, so try to put yourself in their shoes and you’ll find yourself making better decisions throughout. Every piece of content you produce has a natural home somewhere in the sales process. Your job is to find out where that is. Let's get started on that next step right now... pop on over and give our free communications briefing a spin. You'll be glad you did.